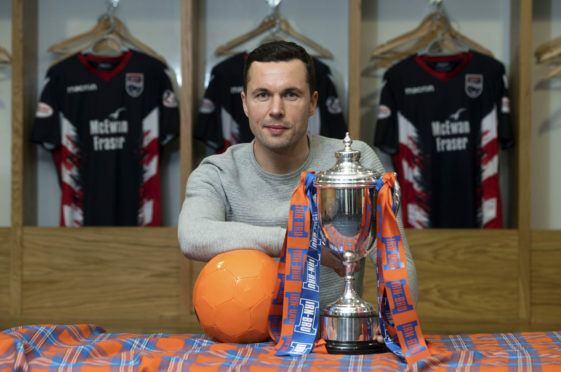 Don Cowie has become a Scottish international and played at the highest level of English football, but winning his maiden silverware in Ross County’s 2006 Challenge Cup victory will always take pride of place in his achievements. Midfielder Cowie led the Staggies to glory in the competition for the first time when he captained Scott Leitch’s men to a penalty shoot-out victory over Clyde following a 1-1 draw at McDiarmid Park. Cowie left County to join rivals Caley Thistle the following year, before spending nearly a decade in English football with Watford, Wigan Athletic and Cardiff City, who he helped steer to promotion to the Premier League in 2012. Having returned to County from Hearts last summer, 10-times capped Scotland player Cowie is determined to repeat his haul of 13 years ago, with County aiming to reach the IRN-BRU Cup final with a last-four victory at home to League 1 side East Fife tomorrow. Cowie said: “I was captain when we won it first and played in the final a couple of years prior when we lost. It wasn’t pretty but who cares? You win it. “Young Jason Crooks scored the winning penalty and it is something I’m sure he’ll never forget. That’s my memory of it – seeing him score the winning penalty. “People might say it is a small tournament, but it is one you feel very proud of when you do it. “County have won it since as well and it is a cup that holds fond memories for us as a club. It has been a good stepping for the club. Winning it put us on the map a wee bit before going onto bigger things with the League Cup win and reaching the Premership. Although County co-managers Steven Ferguson and Stuart Kettlewell are likely to ring the changes for the visit of Darren Young’s Fifers, Cowie, who turns 36 tomorrow, says the prospect of winning silverware will mean just as much to the club’s experienced players as it will to County’s youngsters. Cowie added: “You can’t underestimate how important it is to win medals and trophies because, when you finish your career, you don’t want to be left there with nothing. “I’ve played with someone, Aaron Hughes, who is Northern Ireland’s record cap-holder, played in England’s Premier League for 15 to 20 years, but hasn’t won a trophy. “At Hearts, he would say he’d love to win a medal before he retires. That’s how important it is. “Don’t ever underestimate how important it is when you’re in these cup competitions because, before you know it, you’ll be finished and you won’t have a winners’ medal. “Once you get a taste of it – that euphoria of winning something – and you see what it means to the club and fans, you just want more. Cowie has been sidelined with a hamstring injury in recent weeks and although he admits tomorrow’s tie could be too soon for him he aims to play a major role in the Staggies’ run in, with County three points clear at the top of the Championship and also aiming to book a Scottish Cup quarter final place with a fifth round replay win away to Caley Thistle on Tuesday. Cowie added: “I’m back on the field. Hopefully in the next few days I’ll be able to step it up. “Friday might come a little bit too soon, but we’ll see how it goes over the next few days. “We’ve so many games – that will be Friday, Tuesday, Saturday coming up – in three different competitions. It’s where we want to be, fighting on all fronts.